FIGURE 13-6 Schematic diagram of the female hypothalamic-pituitary-ovarian axis. The model emphasizes both the neural and hormonal feedback controls. Depending upon hormone concentration, time course, and prior hormonal status, E2 can either inhibit or stimulate LH secretion through effects at either the hypothalamus or pituitary. Inhibin produced by the granulosa cells inhibits FSH secretion. 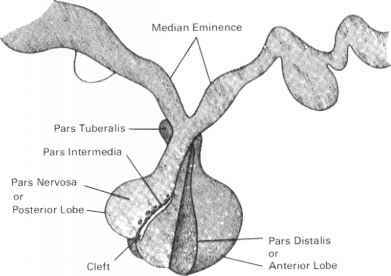 This figure should be compared with Figure 12-8, which diagrams the male hypothalamic-pituitary-testicular axis. Abbreviations: GnRH, gonadotropin-releasing hormone; FSH, follicle-stimulating hormone; I, Inhibin; LH, luteinizing hormone; PRL, prolactin hormone; E2, estradiol; P, progesterone. A dashed line indicates a negative influence, and a solid line indicates a positive influence. the following). Figure 12-6 compares the structures of inhibins and activins. Activins are a class of protein hormones that are either heterodimers or homodimers of the two /3-subunits of inhibin, e.g., either /3a/3b, (iA(ih, or /3B/3B (see Figure 12-6). Activins have been detected in gonadal fluids (particularly follicular fluid), plasma, and the pituitary and other tissues. Activins are known to have a wide range of biological actions, including inhibition of ACTH and growth hormone production, stimulation of erythroid and megakaryocyte cell differentiation (see Chapter 15), and importantly, in the context of this chapter, stimulation of FSH production and release from the pituitary. The activins may also play a role in embryonic differentiation, particularly the induction of mesoderm. Follistatin is a monomeric single-chain protein of 288 amino acids present in follicular fluids and pituitary gonadotroph. Several isoforms (31-45 kDa) exist as a consequence of differential splicing of the mRNA and as a consequence of differential glycosylation. Follistatin has some structural homology with epidermal growth factor (EGF) and human pancreatic trypsin inhibitor. Follistatin will bind to both activin and inhibin through interaction with their /3-subunits. Thus, activin, a /3/3-dimer, will bind two molecules of follistatin, while inhibin, an a/3-dimer, binds only one molecule of follistatin. Follistatin is believed to function biologically as a local modulator of activin function, so as to reduce or block activin-mediated stimulation of FSH secretion. Inhibin is a heterodimeric protein; it has a common a-subunit and one of two /3-subunits. Thus, there are two inhibin isoforms, either inhibin A (a/3A) or inhibin B (a/3B); see Figure 12-6. The /3-subunit is 18 kDa and the a-subunit is 14 kDa. The inhibins structurally belong to the transforming growth factor (TGF^) multigene family (see Chapter 19). The a- and /3-subunits are cross-linked by one or more disulfide bridges. As yet, it is not known whether the detailed structures of male-and female-derived inhibins are identical.